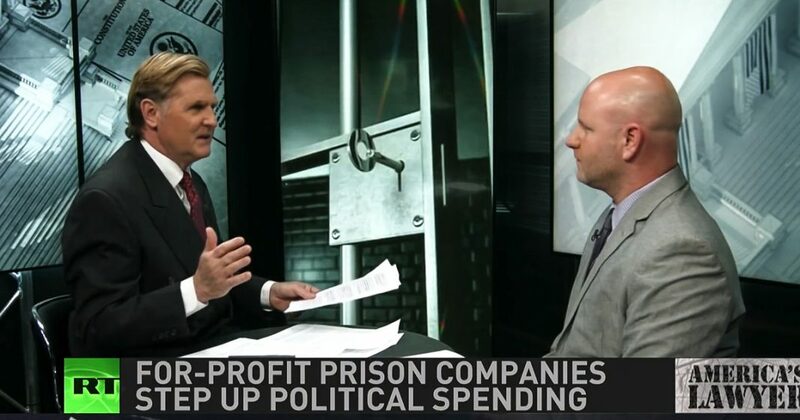 Via America’s Lawyer: Mike Papantonio and Trial Magazine Executive Editor Farron Cousins discuss big banks pulling out of private prisons in efforts to look more favorable to the public. Mike Papantonio: Most people agree that private prisons are bad, but they don’t understand just how bad these companies really are. Let’s put it this way. When Wall Street banks think that you’re too corrupt to do business with, then something’s definitely wrong. I have Farron Cousins here with me to talk about private prisons, and you know, I don’t really see this as the banks leaving for any moral reason. Look, these are banks that pay for fracking, they wash money for terrorists. Back in the last bubble, they kept running it out. They knew what was going to happen to the American public. It’s not that they’re pulling away from funding prisons because they believe that it’s the moral thing to, do you agree with that? Farron Cousins: Oh, absolutely. What they’re doing is they’re pulling out because there’s been massive public pressure over the last two years to get them to pull their money out of these programs. Now, there has been public pressure for a lot of the things you said like, hey banks, stop funding fossil fuel companies. Stop funding fracking, but they figured private prisons was one they could actually easily pull out of and not, you know, maybe gain a few more points with the public. So that’s what they’re doing, but now these private prisons, to make up for the fact that the banks aren’t going to be in charge of their loans and financing them, they’re going to DC and they’re doing two things with their lobbyists. One, is obviously they want more government contracts. They want more prisoners come in their way, but two, and this is a sneaky or thing, they’re lobbying for banking deregulation. So the prisons are trying to come out and say, listen banks, we’re on your side. We’re paying a couple of million dollars to have our guys fight your fight for you. Mike Papantonio: So it’s really trade off. Okay, first of all, the private banks, the banking industry knows if they hang in there long enough, they’re going to make a big profit. So yeah, this could be part of the show, which at the end of all of this, the banks are really not going to be that far away from funding these organizations. I think it’s interesting to note that some of the banks pulling out in saying, Gee Whiz, we can’t be part of this, are some of the bags that have defrauded consumers by making up fake checking accounts and fake savings accounts completely out of the air. They’ve gamed the system on mortgages to where consumers were victims there. So if you look at this list, I mean wells Fargo, I mean really? Like there’s some high ground that Wells Fargo wants to take? This is purely about, and this is the way I see it, yes, they’ve gotten pushback from consumer groups or advocacy groups. Yes, they want to make it look like they want to do the right thing. Truthfully, when the numbers look like they’re attractive enough, it’s not gonna make any difference. We saw that, as I said, with fracking. We saw it in the Wall Street burn down on mortgages. They knew for years what was coming, but they kept it up. We’ve seen it where they’re actually financing terrorism. So there’s really no morality here. Farron Cousins: We’ll exactly, and the reason that banks think this is a safer group to pull out of than the fracking, or any of the others, is because they see that something’s going to happen with the private prisons. We know that there’s more assaults there. It actually costs taxpayers more to put prisoners and private prisons. So they see on the horizon there is likely going to be some kind of changes with the private prison industry because of how bad it is, and they’re getting out while it’s hot and they’re using the cover of, oh, the public wants us out, so we’re doing what the public wants. Mike Papantonio: Here’s what’s important. It’s a $4 billion industry, a $4 billion a year industry already. Right now, the private prisons are about 8% of the prisons. They see that climbing every year. So we’re going to see them back. This is kind of a show.